Nissan has been working hard on its pickup trucks in last few years. We saw all-new 2016 Nissan Titan XD, the truck that slots between light and heavy-duty class and offers better towing capability than light-duty versions but it is less costly than HD models. For an upcoming 2017 model year, Nissan is delivering redesigned light-duty version of Nissan Titan. These two models are essentially different trucks with different running gear despite that their similar names suggesting something opposite. But that’s not all! Nissan also shown Titan Warrior Concept shortly after XD’s debut and what is more some reports suggest that this model might get production version soon as next year and that as 2017 Nissan Titan Warrior. 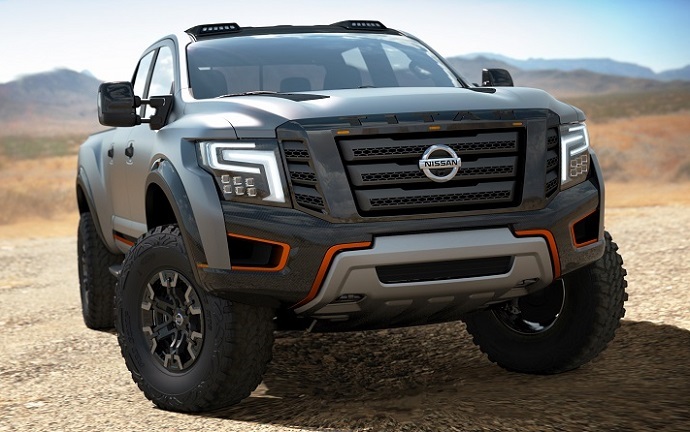 The first thought when Titan Warrior Concept emerged was that this truck looks as direct rival for Ford’s Raptor model and that Nissan tests potential of this kind of truck. An appetite for performance trucks is in progression and it seems that production version of Titan Warrior has a perfect sense despite it might be only another speculation. So, the 2017 Nissan Titan Warrior hasn’t been officially confirmed and available information don’t provide clear picture about how this model might look. However, it is believed that production version will get strong inspiration from the concept but like in almost every case in will be toned-down version of the aforementioned. In that context, it is expected that new Warrior will keep very similar blacked-out interpretation of the grille seen on the concept model but it will use headlights and taillights from the conventional version. Less rugged appearance is also expected with toned-down version of the front bumper and tailgate area. Also contrasting exterior trim accents from the concept are not expected on the production version. Inside the market version is also expected to be less radical with Magma Orange accents while contracting stitching, textures, steering wheel and some other elements will get very similar form as on the concept. The seats with embossed logos will also be there and model will also include the latest infotainment system and safely features like on the XD model. On the performance front, possible solution for 2017 Nissan Titan Warrior is an upgraded Cummins V-8 which is available on the XD and was also used in concept model. In current form it produces 310 hp and peak torque of 555 lb-ft. It will be paired to Aisin six-speed automatic transmission and four-wheel drive with electronically controlled transfer case is expected to be standard. The model should also get improved suspension compared to traditional version with performance shocks, beefier components and axles alongside with new control arms and added underbody protection. It will also include reinforced chassis and braking system. The 2017 Nissan Titan Warrior is rumored to come sometime in 2017 maybe even as 2018 model but nothing has been suggested about its price. Considering its upgraded hardware and features it will cost significantly more than XD model.